The Star represents the balancing point between intuition and practicality. Its position in the deck after the Tower is no mistake, you have come through a great many trials and tribulations, and survived. 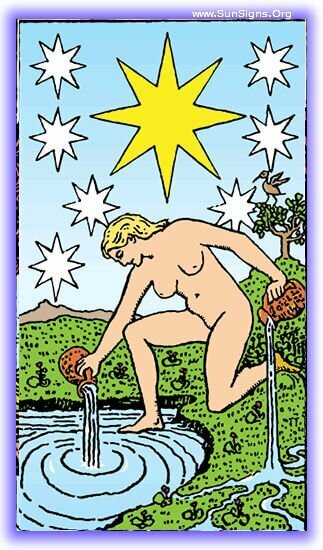 The biggest aspect of life this tarot card of the Major Arcana is that it represents is hope, and that it’s time to be open to the potentials of the future ahead. 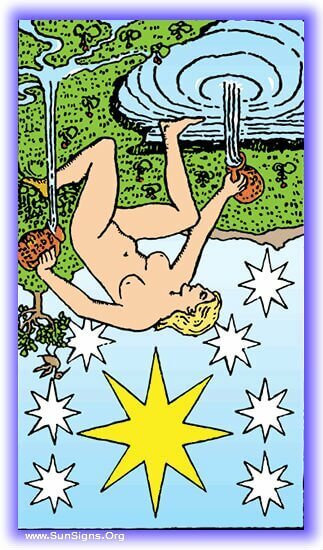 Read on to know more about the Upright and Inverted positions of this Rider Waite tarot card. The Star in this position represents hope and inner peace. It often shows up in this position in times of rebirth, of new beginnings or the hope of the same. It can represent an artist finding the vision of their masterpiece, or just a deep connection with their inner spirit. The past few months have been a wonderful time for you, full of hope, inspiration, and a deep connection to your inner spirit. You came through some trials, possibly some of the most difficult you’ve ever had to face, and came out of it fully alive, full of hope. You have recently come through the fire, and the time of trials is over. You have learned and more, you’ve recovered. The future has a lot of potential in it, it always has, but this is the first time in a long time you’ve seen that potential. Take advantage of this time to pursue your newly revived dreams, follow your bliss and your inspiration, now is the time for healing and growth. Things may seem hard right now, empty and pointless. But take heart, better days are around the corner. In the days to come you will find a bright new inspiration, and your hope will be restored to you. The stars of the night sky are hidden, and so is the hope they bring. The dark night seems endless, and it’s beyond imagination that the dawn will ever come. The eyes that see this are clouded, they can’t see how bright the day really is. You’ve come out of a very dark time, where things just seemed impossible, and like things would never be right again. You didn’t see how bright things were, couldn’t see past the dark miasma of your own depression and despair. But you’ve come out of that time and into the light! The world seems remarkably bleak right now, discouragement and despair are present everywhere. Things may not be as bad as you think, but the lens you see the world through just isn’t making that very obvious. Time to turn your thoughts around and recognize the opportunities that are there. There is a trial coming, and it will have all the imagery of being a difficult one. But don’t let it get you down, things are brighter than you imagine, and it won’t be as hopeless as it seems. Just keep your head up and try to see all the brightness around you, for once, the darkness is illusory.